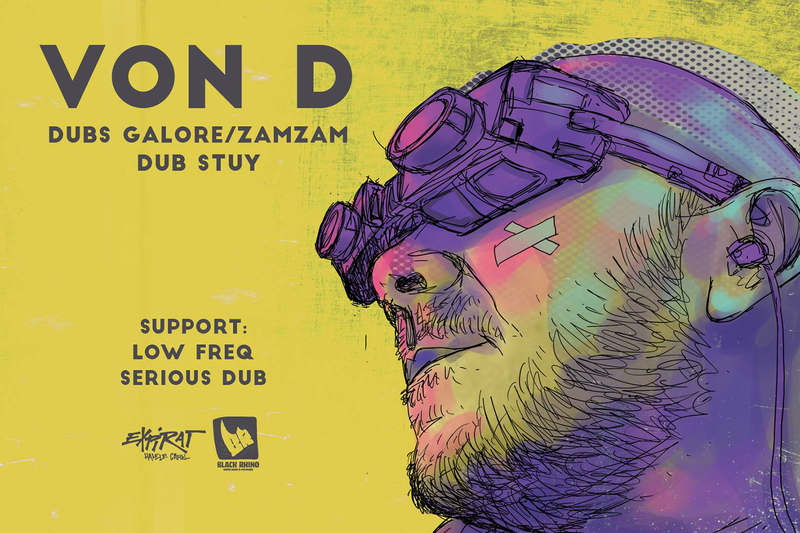 We begin the 2019 monthly residence in Expirat club by inviting the french dub and bass music producer Von D. With three albums and multiple EPs under his belt, Von D is also recognised for featuring exclusive and unreleased dub or dubstep tunes, alongside his own music. With regular shows in Europe, Asia, New Zealand, Australia and five tours in the USA, his world fan base is testament to his skill. Von D is on an increasingly prolific trajectory since last year. Recent 12’s on Scrub a Dub and Khaliphonic (Zamzam), and forthcoming tunes on Lion Charge and Moonshine have signalled his renewed focus on dubwise productions. Serious Dub was born in 2011 as a group of dub/reggae promoters. One year later, Serious Dub co-organised Subsonic Festival 2012, the largest bass music and sound system festival in Romania. From the commitment and passion for dub music and it’s vast and complex universe, Serious Dub productions have emerged. On stage, they offer an evolutive set ranging from dub to steppa in a sound system style, packed with exclusive dubplates, quality sounds and positive vibes.